Recently my daughter came to Los Angeles to visit my family and me for a month. I therefore rescheduled our special family meal for her last Sunday here. Since my daughter is also a food blogger, writing at Eat with Josyy, it was an opportunity for us to prepare a dish together. 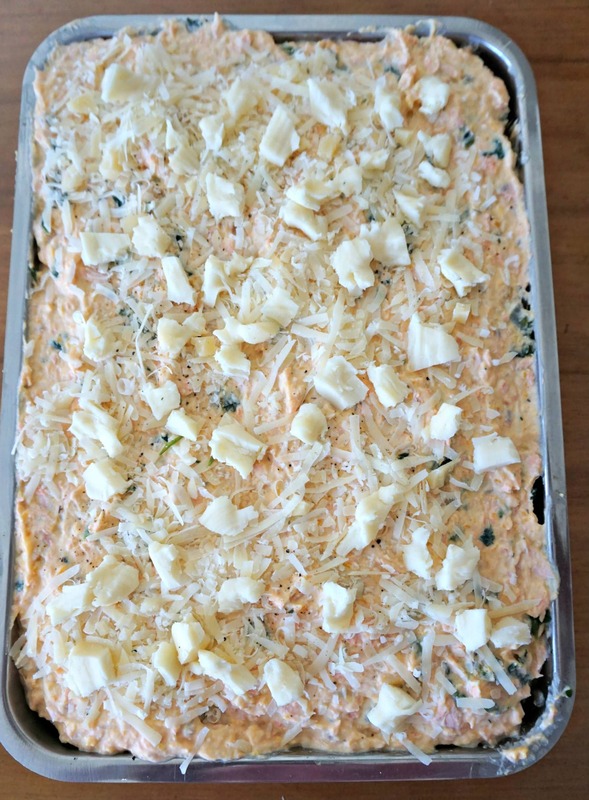 We chose to make Salmon Lasagna, a dish we had previously made for other occasions. 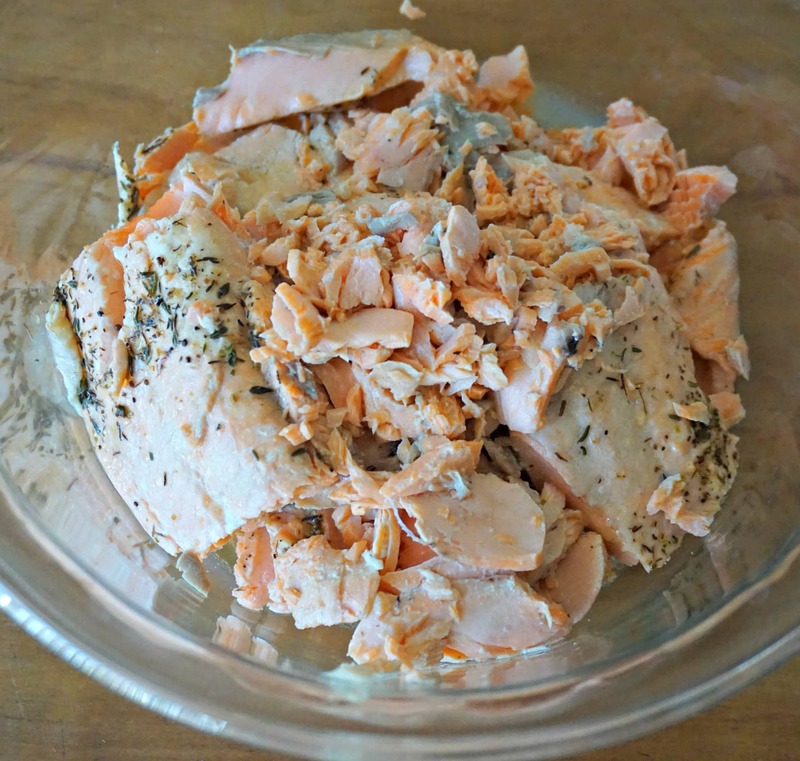 Salmon is one of the few main ingredients that my entire family enjoys. With everyone’s special dietary needs these days, it’s hard to find a dish that will satisfy everyone. The week before our lunch, my father suddenly passed away. So this Sunday lunch took on new meaning for our family as we came together before my daughter returned to Belgium. Like most family meals, it takes more time to prepare the food than to eat it. Fortunately, Salmon Lasagna does not take very much time or effort. It’s ideal for a Sunday lunch when you want to sleep in beforehand. Salmon Lasagna is a one-dish meal, another advantage for choosing it for a Sunday lunch or even a supper after work. For appetizers, we ate chopped vegetables with hummus and tzatziki prepared by my sister-in-law. Then we sat down at the table for the Salmon Lasagna. Everyone loved the Salmon Lasagna and kept commenting how different it was from other lasagnas. It’s surprising that a dish so simple can wow my entire family. Believe me they would not spare me the criticism if they did not enjoy the dish. To end the meal, we delighted ourselves with pastries and cookies from Viktor Benes Bakery. After the meal I was so happy with my choice of Salmon Lasagna for the main course. It helped make a special occasion stress-free. I could enjoy the meal with everyone without having to worry about preparing the next course. Try making Salmon Lasagna for a memorable meal. You will not regret it. If you are not convinced, try the Crusted Salmon instead. Both salmon dishes are quick and easy to make and will spellbind your guests. During autumn try adding some butternut squash or pumpkin puree in your filling. It will not affect the flavor at all of your Salmon Lasagna, yet will help reduce the amount of milk or cheese you need in your filling. Adding some butternut or pumpkin puree will also enhance the nutritional value of this delicious dish. All you need to do is replace one-third to one-half of the ricotta cheese with the same weight of butternut squash or pumpkin puree. 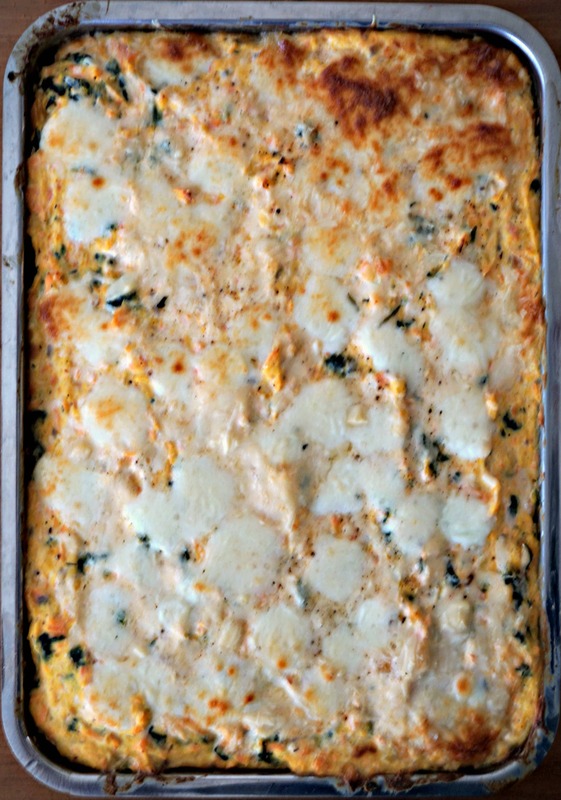 Recently I prepared a Salmon Lasagna with butternut squash puree. None of my guests could detect the butternut squash until I mentioned it. See for yourself. 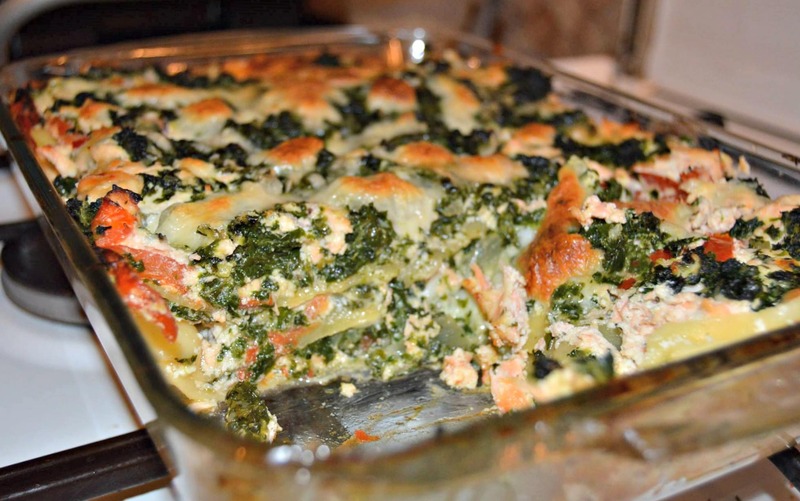 Salmon Lasagna is ideal for special occasions. It's easy to make and tastes wonderful. In the Fall you can also make a butternut squash or pumpkin version. This serving size for this Salmon Lasagna is calculated as a main dish or as a one-dish meal. Preheat the oven to 350°F (180°C). Dice the onions. Place a large pan over a medium-high heat. When hot, pour the olive oil in the pan. Add the onions. Continue to cook them until they become translucent (about 5 minutes). Add the garlic and continue to cook for another minute. Add the spinach and continue over heat until completely cooked. Sprinkle with salt and pepper. Put the spinach in a strainer to eliminate extra moisture. Press with the back of a spoon to help moisture go away. Leave while you prepare the salmon. In the same pan, add the salmon, thyme and water or white wine over a medium-low heat. Cover and cook the salmon until completely opaque (about 5 minutes). Instead of water, you can use the white wine. Remove the salmon from the heat. Let it cool off. Afterwards put the cooked salmon and ricotta cheese in a large bowl. If you add butternut squash or pumpkin puree, add also into the bowl. See notes below. Add the pinches of nutmeg. Sprinkle with salt and pepper. Don't be stingy with the salt and pepper. Slice thickly the tomatoes and put them on a plate. Shred the mozzarella cheese and grate the Parmesan cheese. Put in separate bowls. Take a large rectangular pan (9" x 13" / 23cm x 33cm). Put a little sauce on the bottom of the pan. Place lasagna sheets on top of the sauce. It's ok if there's a little space around the edges. Spread 1/3 of the sliced tomatoes on top of the lasagna sheets. Then spread 1/3 of the spinach on top of the tomatoes, After spread 1/3 of the sauce on top of the spinach. Finally sprinkle mozzarella and Parmesan cheese on top of the sauce. 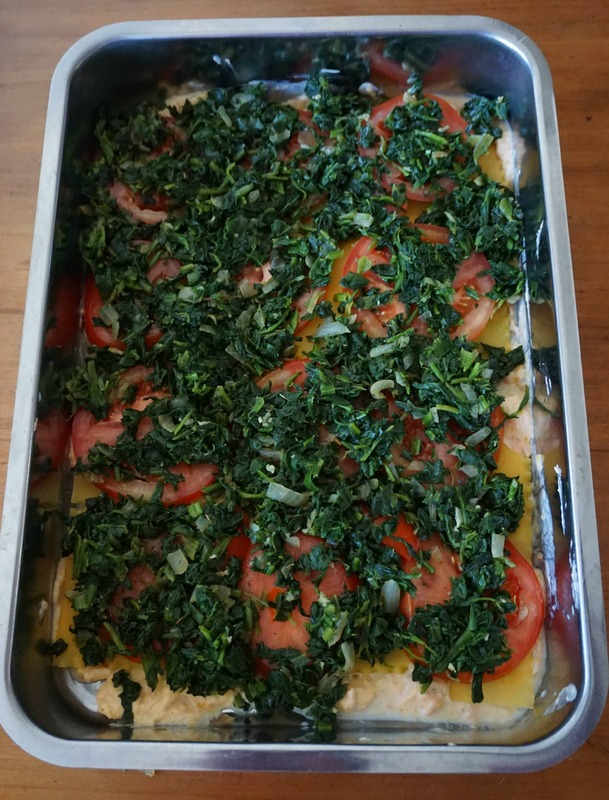 Continue in same way for 2 more layers: adding 1/3 of the lasagna sheets, tomato slices, spinach, sauce and cheese. It's ok of not every space is filled with each ingredient on each layer. Place the lasagna pan in the oven. Bake about 40 - 45 minutes until the cheese is completely melted and the top becomes golden brown. Remove from oven. Wait a couple minutes before cutting and serving the portions. Enjoy! If you want to add butternut squash or pumpkin puree to your lasagna, replace one-third to one-half of the ricotta cheese indicated in the recipe for the same weight of butternut squash or pumpkin puree. In the photos above, you'll see that I used fresh salmon that I poached in dry white wine. I left some skin on the salmon, as it will not make a difference in this dish since the salmon is mixed in well with the other ingredients. 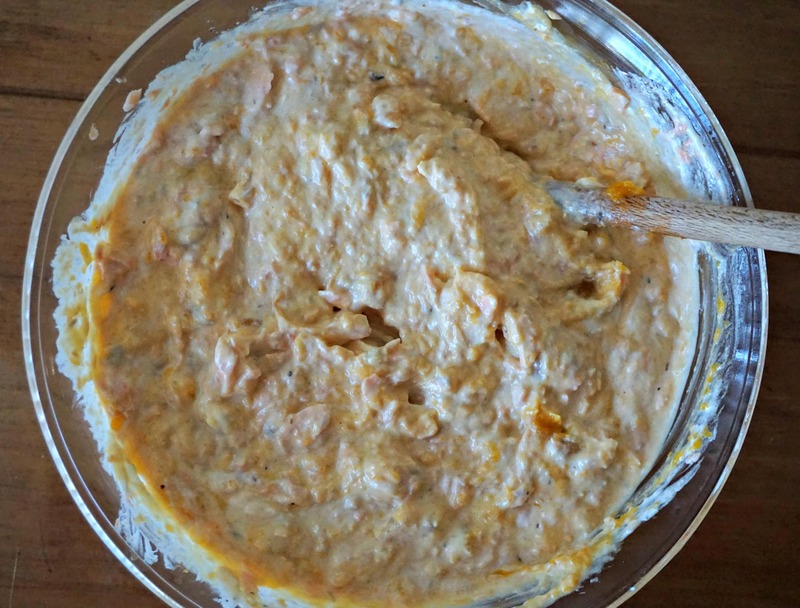 By sauce, so you mean the salmon cheese mixture? And do the lasagne noodles cook through from the moisture of the tomatoes and spinach? Hi Marisa, yes the salmon cheese mixture. 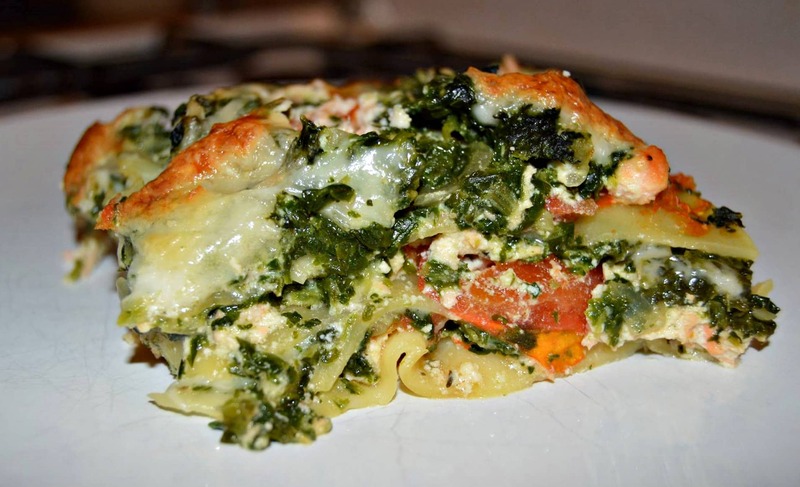 The lasagna noodles do cook through from the moisture of the sauce, tomatoes and spinach. You can also parboil the lasagna noodles about 4 minutes in advance if you want to make sure the noodles are cooked thoroughly. I have not had any problems though without parboiling. I use De Cecco lasagna noodles. Send me your feedback if you make it! Your lasagna is great! I love salmon! Adding butternut squash is a great idea. I wanted to wish you and your family happy new year!! Bonne année!! Hi Malika, this dish is a sure hit! Perfect for a special occasion. Share your feedback when you make it. Thanks!